There have been many investigations of the alignment of nematic liquid crystals by either a magnetic and/or an electric field. The basic features of the important hydrodynamic processes for low molar mass nematics have been characterized for the systems in their equilibrium and non-equilibrium states. These have been created using electric and magnetic fields to align the director and deuterium nuclear magnetic resonance (2H NMR) spectroscopy has been used to explore this alignment. Theoretical models based on continuum theory have been developed to complement the experiments and found to describe successfully the static and the dynamic phenomena observed. Such macroscopic behaviour has been investigated with 2H NMR spectroscopy, in which an electric field in addition to the magnetic field of the spectrometer is used to rotate the director and produce a non-equilibrium state. This powerful technique has proved to be especially valuable for the investigation of nematic liquid crystals. 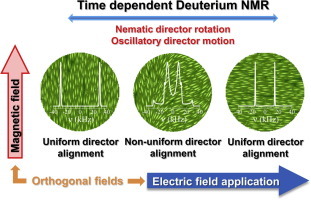 Since the quadrupolar splitting for deuterons observed in the liquid crystal phase is determined by the angle between the director and the magnetic field, time-resolved and time-averaged 2H NMR spectroscopies can be employed to investigate the dynamic director alignment process in a thin nematic film following the application or removal of an electric field. In this article, we describe some seminal studies to illustrate the field-induced static and dynamic director alignment for low molar mass nematics. [NMR paper] Signal intensities in (1)H-(13)C CP and INEPT MAS NMR of liquid crystals.